Oh what a dreamy recipe this is and what a dreamy collaboration. 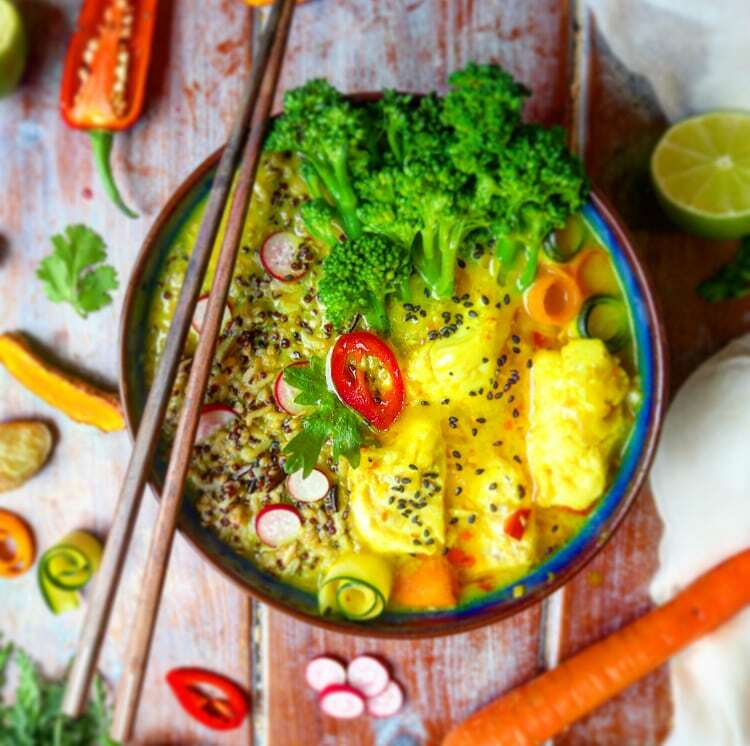 I am so pleased that the lovely Emily, from the Wright Foodie, is sharing her yummy turmeric & lemongrass coconut fish curry recipe with us all. Emily and I met on instagram and I feel continuously inspired by her amazing food shots but also by her ethos. As a busy mum to small children Emily’s recipes are family friendly and you can easily spice them up for a moorish adult meal too. Here is what she says about this recipe. Do go and take a look at all her other yummy dishes too! And if you’d like more information about turmeric in general then head over to cognitive for a great overview. This is the perfect change-of-season type of meal as it is loaded with anti-inflammatory, anti-bacterial and anti-viral ingredients that help our immune systems fight off the dreaded germs that seem to attack as soon as the kids go back to school. It is not only a deliciously tasty and warming meal but also a great cold preventer. The fragrant ginger, turmeric and lemongrass pack a real Thai flavour punch and the spiciness from the chillies are perfectly offset by the soothing coconut milk. I like to have individual portions stocked in my freezer, happy in the knowledge that I can have a nutrient dense dinner on tap for those days I start to feel a little under the weather. It is also a versatile broth that can be used to make a chicken curry or else form the base for a vegan stew with tofu. Garlic is a powerful anti-microbial food (especially if you are brave enough to eat it raw!) and the active constituent of ginger is a compound called gingerol that is especially helpful at fighting infections in the respiratory tract. And turmeric, oh my darling turmeric, is the Queen of all of the healing spices! Those of you who regularly follow my recipes will know that I am borderline obsessed with it and constantly live my life with stained yellow fingers as a result! It has some of the most reliable scientific backing when it comes to its alleged super powers. The active ingredient in turmeric is called Curcumin and it has potent antioxidant capabilities that have been shown to help with a whole variety of health concerns, from arthritis to digestive problems. Western medicine has begun to study turmeric as a pain reliever, as an anti-inflammatory, and as a healing agent. Amazingly, curcumin has also shown promise as having both protective effects against cancer and even potential as part of cancer treatment itself. But whilst the laboratory research is incredibly promising, there is currently no conclusive evidence to show that turmeric can prevent or treat cancer in humans. However, turmeric on it’s own is not particularly well absorbed by the body. It needs to be consumed with a fat (like the oil and coconut milk in this recipe) and some black pepper. The active ingredient in black pepper is called piperine and research has shown that by combining the piperine and the turmeric, it can actually enhance the curcumin absorption by up to 2000%! One serving provides 347 calories and 32g of good quality protein. It also provides half of my daily Vitamin C and Calcium requirements, as well as a massive 87% of my Iron. · Dice the onions, leeks and celery. · Finely dice the chilli and the lemongrass (remove the first 2-3 tough outer layers first and only use the softer bendier middle part). · Mince the garlic and grate the ginger and turmeric. · Heat the oil in a medium saucepan and sweat the onions, leeks and celery for 5 minutes. · Add the garlic, chilli, lemongrass, turmeric and ginger and fry for one more minute before adding the coconut milk and kafir lime leaves (if using). · Simmer for 10 minutes. · Add the haddock and continue to simmer until fully cooked through (approximately 10 minutes). · Add the juice and zest of 1 lime. · Season with a little salt and a generous amount of black pepper. · Remove the kaffir lime leaves. · Serve over a bed of wholegrain rice or quinoa, alongside some tenderstem broccoli or other leafy greens. Emily Wright (The Wright Foodie) is a nutritional cook specializing in customized cooking courses and bespoke meal planning advice to help alleviate a variety of health concerns from diabetes, to leaky gut, to weight loss to fussy kids.